Have a new fire phone from Amazon? 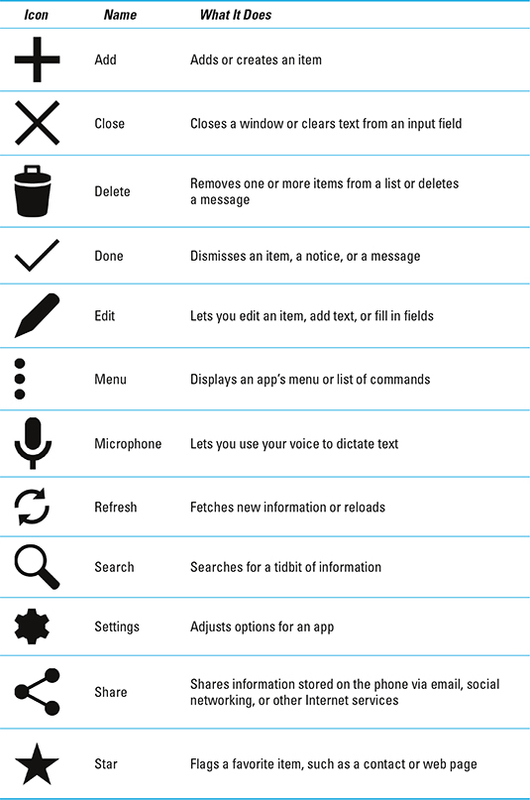 This Cheat Sheet deciphers the Home Screen, shows what common Fire phone icons represent, and offers tips on using the touchscreen. You also get some handy tricks on using the device and, if you get stuck, you find out how to get help and support. 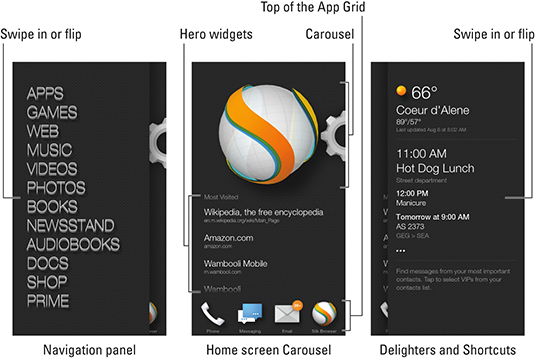 The Fire phone’s Home screen is where you find the Carousel, a list of recent apps, plus hero widgets that help you use the apps. Popping out from the left is the Navigation panel, which lists interesting destinations on the Fire phone. From the right, you find the Delighters and Shortcuts panel, which shows the weather, your schedule, messages, and other updates. At the bottom of the Home screen, you see the top row of the App Grid. To view the entire App Grid, swipe the screen from bottom to top. The App Grid is where you find all the apps installed on your phone or waiting to be installed from the cloud. Sliding in from the top of the Home screen is the Notifications panel. It includes a set of Quick Action buttons plus a list of notifications, letting you know of new messages, updates, appointments, and other useful info. 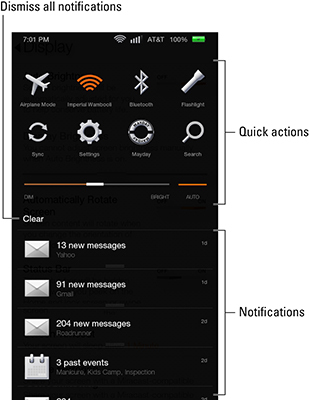 The Notifications panel is available at any time you use the phone: Swipe the screen from top to bottom to view it. 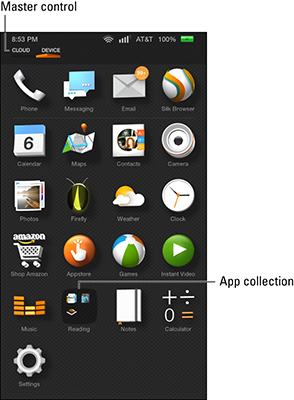 To keep you from going nuts, the Fire phone sports a handy set of common icons. These symbols all work as buttons on the touchscreen. To perform a specific task or action, touch the appropriate icon. The icons are quite consistent between the various apps you use. The most common icons are shown in the following table. You can perform basic actions on your Fire phone’s touchscreen. It’s just a matter of teaching your fingers to do what you want them to. Tap Touch the screen and quickly remove your finger. Long-press Touch a spot on the screen and hold your finger down. Double-tap Touch the screen twice in the same location. together as you continue to touch the screen. touching the screen as you spread them. map, or another object on the screen. Voice input! You can speak into the phone as an effective and quick alternative to using the onscreen keyboard. Tap the Microphone icon to initiate voice input. Quickly switch between apps by displaying the Quick Switch list. To view that list, press the Home button twice. Pin favorite apps to the Carousel: Long-press the app icon and choose the Pin to Front command. Whenever possible, try to use the phone’s Wi-Fi Internet connection to avoid incurring mobile data surcharges. Press and hold a key on the onscreen keyboard to peruse alternative characters. Spread your fingers to zoom into a web page, where it’s much easier to click on links. Instantly unlock the phone and run the Camera app by pressing the Camera / Firefly button on the phone’s left side. Quickly put the phone into Vibration mode by pressing the Down Volume key until the phone vibrates. When you’re on a call, press the Power/Lock key to lock the phone and turn off the touchscreen. Use the Search icon to look for things on the phone, on the Internet, or in a specific app. Use the Fire phone’s Mayday feature to speak with a real, live Amazon helpful host. Start Mayday by opening the Help app, found on the App Grid. Tap the Connect button to get started. You can also access online documentation by starting the Help app, displaying the Navigation panel, and then choosing the User Guide item. From another phone, dial 800-331-0500, or head over to AT&T’s web page support. On the phone, you can get in touch with AT&T support by dialing 611.